The Gaza Strip is often described as the “world’s largest open-air prison” due to the virtual immobility of its population. The 1.4 million residents (three-quarters of them refugees and half under the age of 14) are surrounded by fences and walls to the north, east, and south, and have limited access to the Mediterranean Sea to the west. Living in an area only slightly larger than twice the size of Washington D.C., but with a population density three times that of Manhattan, its inhabitants have witnessed a turbulent history: starting with the Egyptian occupation in 1948, the Israeli occupation in 1967, and finally a unilateral withdrawal of Israel’s forces and settlers in 2005. When Hamas came to power after winning the majority of parliamentary seats in the January 2006 elections, cooperation between Palestinian and Israeli officials became impossible. Israel (which, along with the US and the EU, views Hamas as a terrorist organization) and Hamas (which does not recognize Israel’s right to exist) could not coordinate the operation of the crossing points. Thus the fragile agreements on movement and access crumbled, leaving the people of Gaza unoccupied, but locked in. 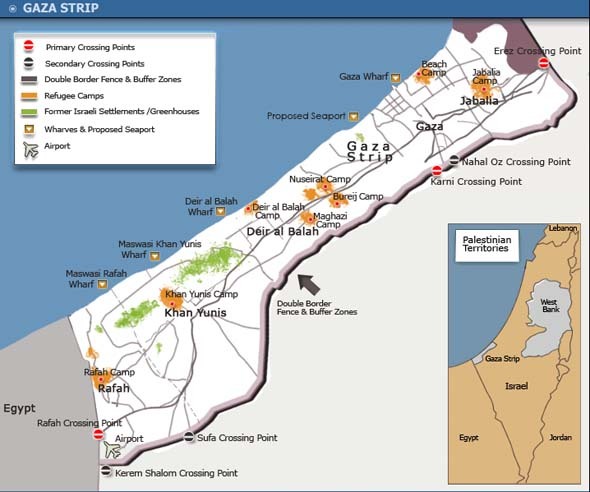 Below is a map that outlines the various aspects of movement in and out of Gaza as of August 2007. Equipped with metal detectors and x-ray machines one might find at an airport, Erez is the main crossing point for people going to and from Gaza. Over the years the crossing was frequently closed, which made it difficult for many residents to earn their wages in Israel. As of June of 2007, Erez is no longer open to Palestinians, except those employed in an international organization or in need of urgent humanitarian assistance. Besides the hundreds of Fatah refugees that fled Gaza after the factional violence, Erez is being used almost exclusively as an entry point for diplomats, foreign journalists, doctors, and medical supplies. The Karni crossing is designated for the transfer of goods between Israel and Gaza. It is the only crossing equipped to handle containers and Palestinian exports. With a 30-foot-high concrete wall and 30 cargo bays, the incoming Israeli trucks transfer goods across a conveyor belt without ever seeing the other side. Karni was often closed, even before the Hamas takeover, which resulted in great losses for Palestinian exporters and shortages of basic supplies within Gaza. Since the Hamas takeover, Karni has been closed. However, the massive conveyor belts designed to transfer gravel have been fitted to take grain to the Palestinian side. The Rafah crossing is operated by Palestinians and Egyptians and monitored by European Union representatives on-site and Israeli officials through a video link. Palestinians can only export goods from Rafah, as Israel has prohibited the import of goods due to security concerns. The Hamas takeover in June of 2007 was largely fueled by weapons smuggling at Rafah, which has been closed since. The Nahal Oz crossing is the entrance point for Gaza’s fuel. Similar to other crossings, the two sides hardly interact, as the Israeli tankers feed the fuel through underground pipes into Gaza. Planned as a back-up for Kerem Shalom, as of June 2007 Sufa is reportedly receiving the bulk of goods destined for the Gaza Strip. Trucks unload their goods onto a fenced off section until 3 PM when Palestinians are allowed to send in their trucks to pick up them up. Kerem Shalom, or “vineyard of peace,” has become the main entrance point for food, medicine, and other humanitarian supplies since June of 2007. The Israeli trucks first transfer their load to a “sterile” truck inside the terminal, which then proceeds to the other side and unloads onto a third Palestinian vehicle. Since this complicated process takes time (Kerem Shalom can only process about 20 trucks a day) the crossing is reserved for products that require refrigeration. Israel plans to use the crossing as an alternative to Rafah in order to monitor the transfer of goods and the movement of people between Egypt and Gaza (since Gaza, Egypt, and Israel’s borders all meet there). Kerem Shalom has been closed several times recently due to rocket and mortar attacks. The fence, which runs along the northern and eastern edges of Gaza, was completed in 1996 as part of the Oslo Accords’ transfer of territory to the Palestinian Authority. After the intifada (uprising) of 2000, which left much of the fence destroyed, Israel rebuilt the barrier, reinforced it with overlapping observation posts, and imposed a one-kilometer buffer zone. The Israeli Defense Forces (IDF) who guard the electrified fence were issued new rules of engagement that, for example, allowed them to fire on anyone crawling near the fence at night. Tunneling was made very difficult after the creation of the buffer zone, but still existed near the Egyptian border, or what is known as the Philadelphia corridor. Here militants used tunnels to smuggle arms in from Egypt until Israeli troops began building underground walls. The kidnapping of nineteen year-old Israeli soldier Gilad Shalit in June of 2006 was carried out by militants who spent months digging a tunnel that ran for 800 yards in Gaza and 300 yards in Israel. This was made possible due to the location of the tunnel, near the Karem Shalom crossing, where the Israeli border meets the less secure Egypt-Gaza border. The militants used the buffer-less zone of the corner to dig diagonally into the IDF outpost. Militants in Gaza adapted to the virtually impenetrable barrier by developing Qassam rockets, steel artillery rockets, which they continually fire into Israeli territory. However, Gaza�s fence was unambiguously effective at thwarting terrorists from crossing into Israel and its success increased public support for the construction of a highly controversial barrier around the West Bank (the larger Palestinian territory on the western bank of the Jordan River, northeast of Gaza). Work on this 670 kilometer hybrid of wall and fence began in June of 2002 and about half of it is completed as of August 2007. More than three-quarters of Gaza’s total population are registered refugees who fled the 1948 Arab-Israeli war, which is known to the Palestinians as ‘El-Naqba’, or ‘the Catastrophe’. Some 200,000 refugees inflated Gaza’s population, which at the time was estimated to be only 80,000. Sixty years later that figure stands at 1.4 million people, making the narrow strip one of the most densely populated areas in the world. Below is a list of the population distribution among the camps. Over half of the refugee population lives in these eight camps. The United Nations runs schools and health care facilities in the refugee camps, as well as providing services such as trash collection. 20% of the camps lack sewage, many don’t have paved roads and the majority of houses are made of concrete walls with asbestos roofing. The appalling conditions in many of these camps have transformed them into recruitment centers for radical groups. The first Palestinian intifada broke out in Jabalia Camp in 1987. When Israel withdrew from Gaza, it destroyed 1,500 homes once occupied by settlers, but two types of buildings were left standing: synagogues and greenhouses. James Wolfensohn, who at the time was the special envoy for the Quartet to the Middle East – U.S., E.U., UN, and Russia – got wealthy Jewish-Americans to compensate the settlers with $14 million (half a million came out of his own pocket) and the 800 acres of greenhouses were not dismantled. These greenhouses were seen as a vital acquisition for they employed 3,600 workers who were mostly Palestinian, and created an extra 3,000 jobs once the settler workforce was replaced. On top of that it was projected that the harvest would inject up to $100 million of much needed annual revenues into Palestinian Authority coffers. But as the settlers left, the greenhouses were looted by Palestinians seeking expensive equipment like computers used to monitor the plants and water pumps for irrigation. The farmers overcame this, and after repairs were able to plant produce and flowers in time. Yet, when the harvest season arrived, the Karni export crossing was often closed or very backed up. The international community had brokered an Agreement on Movement and Access between the parties that called for passages to be open “on an urgent basis” for the 2005 harvest, but safety concerns trumped the stipulations of the document. Produce was dumped on the side of the road even when Karni was open because extensive searching of perishable goods like seafood and strawberries (on tarmacs exposed to the heat and dust) meant that about 10% of each shipment had to be discarded. Under the Oslo Accords of 1993, Palestinians are allowed to fish up to 20 nautical miles off the coast of Gaza, with �buffer zones� near the Egyptian and Israeli borders. Due to Israeli security concerns however, access has been restricted to six nautical miles, which has led to over-fishing in the shallow coastal waters, which in turn leads to the depletion of breeding grounds. Israeli gunboats patrol the restricted areas and have attacked fishing boats that come too close, often imposing arbitrary restrictions. In order to boost the Palestinian economy and establish a “symbol of national sovereignty” the Palestinian authority and the international community planned to build a seaport for Gaza. Construction of a $35 million port began in July of 2000 but was halted in October when Israel refused to let in construction materials due to the second intifada. Construction of the port never resumed. Planning began for a new $88 million seaport after the Israeli withdrawal from Gaza in 2005, but with the Hamas takeover in June of 2007 the project was aborted. Gaza’s Yasser Arafat International Airport was inaugurated in 1998 and cost approximately $70 million, donated by Egypt, Saudi Arabia, Spain, and Germany. The airport was built by Moroccan architects and has an intricate design modeled after the Casablanca airport. A grand inauguration included distinguished international guests, and the airport has received several heads of state including former president Bill Clinton who landed on the airport’s single runway aboard Air Force One. Palestine Airlines flew three donated aircrafts to and from countries like Egypt, Jordan, the Gulf States, Saudi Arabia, Morocco, Turkey, and Cyprus. However, during the 2000 Palestinian intifada (uprising), the Israeli Defense Forces shut down the airport and then later bombed the radar station and sent armored bulldozers to destroy the runway. To this day the airport’s staff of 500 continue to show up for work daily. Despite the inoperative runway, they maintain hope the airport and equipment will soon be reopened. The estimated cost of repairing the airport is $20 million, but Israel has refused to allow repairs to begin. Until then the airport will remain a museum of what Palestinian sovereignty might have looked like: buses filled with schoolchildren tour the facilities every year. Sources: Al Jazeera, BBC, The Baltimore Sun, Boston Globe, CNN, Christian Science Monitor, The Washington Institute for Near East Policy, CBS News, MSNBC, USA Today, The New York Times, LA Times, Israel Ministry of Foreign Affairs, United Nations Relief and Works Agency for Palestine Refugees in the Near East (UNRWA), RICS Foundation, United Nations.